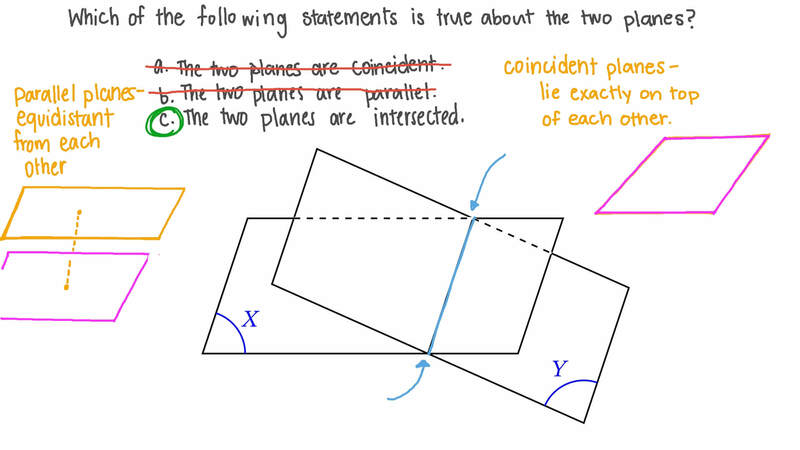 In this lesson, we will learn how to identify the relationships between lines and planes and find the results of these intersections. In the following figure, determine the intersection of plane 𝐴 𝐷 𝐴 ′ and plane 𝐵 𝐷 𝐵 ′ . Using the cube below, decide which of the following describe the relative position of the planes 𝐴 ′ 𝐵 ′ 𝐵 𝐴 and 𝐴 ′ 𝐵 ′ 𝐶 𝐷 . Using the cube below, decide which of the following describe the relative position of the planes 𝐴 𝐵 𝐶 and 𝐴 ′ 𝐵 ′ 𝐷 . In the following figure, determine the intersection of plane 𝐴 𝐷 𝐵 and plane 𝐴 𝐵 𝐶 . In the following figure, determine the intersection of plane 𝐴 𝐷 𝐵 and plane 𝐵 𝐶 𝐶 ′ 𝐵 ′ . 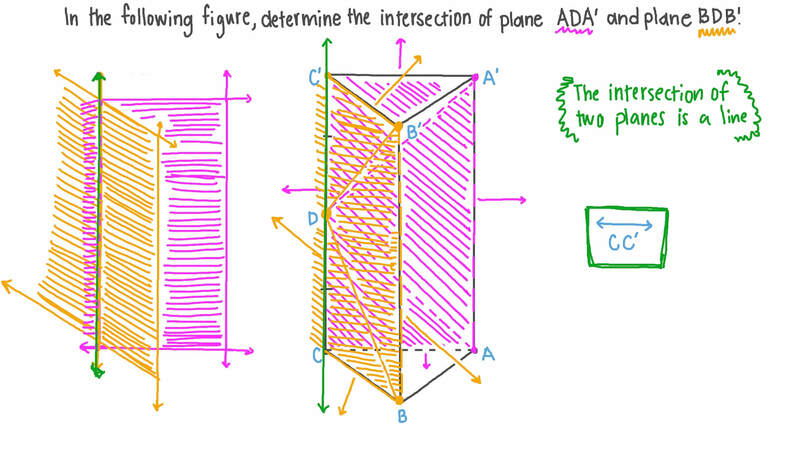 Determine the intersection of plane X with plane ABC. Find three planes that pass through both of the points 𝐵 and 𝐶 . Using the cube below, decide which of the following describe the relative position of the planes 𝐴 𝐵 𝐵 ′ 𝐴 ′ and 𝐷 𝐶 𝐶 ′ 𝐷 ′ . Which of the following is a plane that is parallel to 𝐴 𝐵 𝐶 𝐷 ?